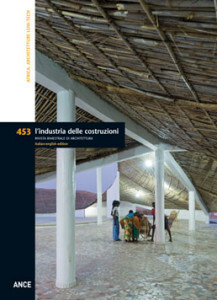 The projects presented in this issue of the magazine were not selected to illustrate the production of a continent as wide as it is geographically, culturally and socio-economically multifaceted, nor to assume a small group of examples as representative of an architectural trend in contemporary Africa. The idea was to stimulate a wider reflection on the possibilities offered to architecture, today, to express itself in terms of “ethics” as well as “beauty” in the face of scarce economic means, social emergencies and climatic adversities. Globalisation and the energy and environmental crisis have ushered in changes unimaginable only twenty years ago, forcing many so-called developing nations to drastically reduce available resources, with evident repercussions on the use and transformation of the territory, as well as habits and lifestyles. What interests us in the buildings we have selected is not the language employed by different authors to express themselves, what is more almost never autochthonous to the site of the projects, but the fact that these very small works of architecture are the result of a virtuous process capable of holding together social issues, a sensible use of the territory and available resources, while also contributing to the activation of a local micro-economy; architecture appears to reacquire its meaning as a collective process, while its authors, faced with urgent necessities, rediscover common sense and a skill for invention. We must learn from Africa, though certainly not to imitate projects and solutions that are non-reproducible born in highly particular and specific circumstances, but in order to once again ask questions about the values, methods and techniques of the profession at a time of crisis. The projects illustrated here confront various themes and manage to give strength and substance to a design idea and its realisation. Immersed in the lush landscape of Rwanda, the building designed by Dominikus Stark Architekten emerges discretely from the horizon as a depthless and compact monolith. Situated in Nyanza and born of a private initiative, the building is home to a multipurpose Information Technology centre. The system of compounding consists of a group of buildings with similar functions, characterised by the presence of an outdoor space and a precise demarcation of the limit between public and private. This demarcation can be embodied by the buildings themselves or an element defining an edge, such as a perimeter wall, dense vegetation or a fence, containing various constructions and dedicated outdoor spaces. In this specific case, the typology was re-proposed based on an organisation of buildings that function as edges and the demarcation of the line between the public domain, grouped around a large private central space. In the Zulu language ITHUBA means opportunity. The word was adopted as the name of the educational centre created in 2008 by the NGO S²arch, in a suburb of the South African metropolis of Johannesburg. The first phase of the programme involved the completion of a secondary school, the ITHUBA Skills College, created to offer a proper basic education to young people from the local community and facilitate their entrance into the workplace. The buildings of the experimental school were designed during ateliers and workshops involving students from European schools. The same designers were also involved in the phase of construction, together with local society, the NGO and future users. By 2009 it was time to expand the educational programme and its facilities by adding an elementary school and high school to the site, connected with and related to the existing structures. The general plan is based on the distribution of the new classrooms and accessory functions in isolated buildings that alternate with large landscaped outdoor spaces. 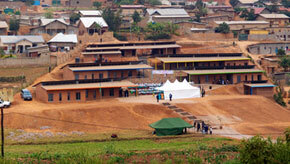 The Umubano School is a scholastic complex for up to 300 children. 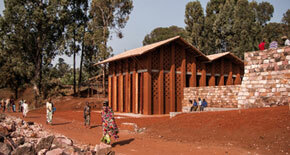 The centre was designed by Mass Design Group and commissioned by an English NGO. The project is situated in Kabeza, a neighbourhood of Kigali, in Rwanda.Resting on the slope of one of the hills defining the profile of the city, the school is discretely inserted into its neighbouring constructions.This private project obtained the appreciation of the Government and the consensus of local residents. It has come to represent a symbol of development in a district devoid of services and a meeting point and landmark. The building is grafted onto the hillside by a series of terraces of differing heights. Each of the five terraces hosts the classes and students of a specific age group. This approach means that all of the classrooms have their own dedicated outdoor spaces. 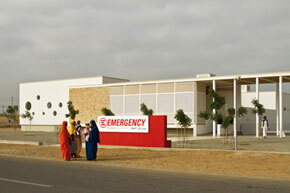 The paediatric health care centre designed by Tamassociati for Emergency is situated in a suburb of Port Sudan, the strategic seaside settlement of the entire nation. The hospital is the only healthcare outpost in the area providing free assistance to the urban population, witness to an exponential and dramatic growth in recent years. The structure is based on the model of the enclosed compound; openings in the exterior are limited and the composition is articulated by an alternation of closed spaces connected to or flanked by a system of courtyards. In addition to these direct spaces, the parti also features a series of other collective external spaces. They constitute an integral part of the programme, embodying the desire to make the centre not only a healthcare facility, but also a space of social revitalization, open to use by the public. 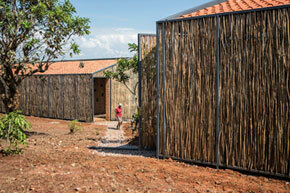 The small building takes form as a porticoed circulation space based on the typology of the loggia, a common element in the homes of Burundi and much of Sub-Saharan Africa. In local culture, this element is the space of relation par excellence, a portion of the home open to the community and social interaction. The loggia of the library is deliberately oversized; it is a space of transit and access, but also an autonomous space in its own right. It is a space of release and expansion for the internal space overlooked by it through a series of glass doors. 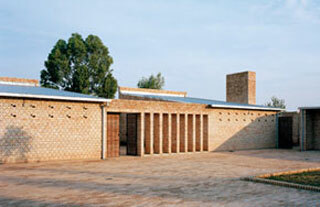 The form and rhythm of the building are a direct result of the building technology adopted and the use of locally available materials: CEB (Compressed Earth Blocks) and site cast terracotta tiles. Near the city of Kayonza in Rwanda, an approximately one hectare site is home to this centre that welcomes and offers assistance to women who have survived wars and conflicts. Sharon Davis Design has created a micro-village that integrates a number of functions typical of an urban context with agricultural and farming activities necessary for day to day living. The scheme of the system is based on the archetype of the traditional rural sentiment in Rwanda, in which a series of small residential pavilions are gathered together to create a sense of community and collaboration. The numerous functions of the programme are distributed in small buildings that animate this wide site, in a continuous dichotomy between built spaces, separated by equally designed open spaces. 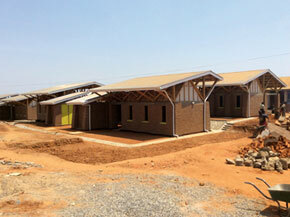 This residential complex is home to 15 permanent lodgings for minors, orphans and young people in difficulty. It is situated in a costal city of Djibouti, near the Horn of Africa. The project was conditioned by twofold aspects: on the one hand determinant environmental conditions, on the other hand the habits of settlement of the local population, accustomed to living primarily in open spaces. The synthesis that links these two issues resulted in the choice of a scheme inspired by the model of the medina.The spatial configuration of a medina is marked by the rhythmic alternation of constructions and open spaces. Each individual nucleus features all of the necessary spaces and facilities typical of a private residence. Double or triple rooms host a maximum of ten children per apartment. A detailed study was made to ensure optimum natural ventilation in all of the interior spaces: external routes function as ventilation stacks; they are flanked by residential spaces featuring openings of varying dimensions. 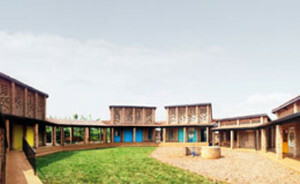 The design of this centre for disadvantaged and abandoned children was completed by Orkidstudio in the small town of Nakuru, Kenya, a rapidly expanding rural area. The centre differs from similar structures realised in Africa: it moves away from the immense dormitories housing large numbers of children in a single space that is often squalid and anonymous. The building stands out for its domestic appearance, small though comfortable spaces and for its proper use of natural ventilation and lighting. The simple plan is comprised of two volumes facing one another. At one end of the lot they appear to be held together by a perimeter wall, while on the opposite side they gradually separate to create an intercluded courtyard that opens up toward the rest of the site. The Government recently implemented an initiative to help prevent these phenomena by promoting the construction of 130 structures where expectant mothers can move and receive the necessary specialised support. Mass Design Group created an experimental prototype for this initiative. Their village designed in Kasungu was presented as a possible alternative to the facilities financed and built as part of the national programme. To encourage women to move temporarily to the structure, the project reproduces a domestic and familiar environment, fragmenting a model governed by a large shared dormitory into an aggregation of smaller buildings. 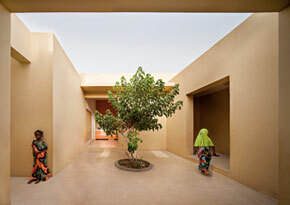 A base module, composed of three dwellings, a service block and a small intercluded courtyard, generate a cross-shaped composition that can be replicated to create larger or smaller settlements. 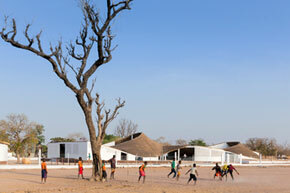 Situated in a rural village in the north-east part of the country, this arts centre designed by Toshiko Mori enhances the existing services in the area and offers the small local community flexible multipurpose space.The primary purpose of the building is to host exhibitions, performances and workshops. It also serves as a common meeting space for the twelve different tribes present in the area and aims at facilitating the sharing of traditional artistic heritage and an understanding of expressions from other backgrounds. The building takes form under a large straw and bamboo roof. Its appearance and assembly are a take on the pitched roofs typical of local construction. 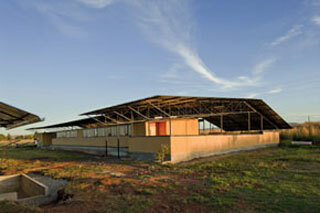 The spaces below the roof are free and flexible, and only in minimum part contained within a compact envelope. 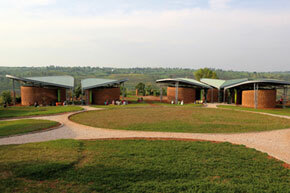 The layout of the project, which rests atop a gently sloping site, responds to the hospital’s primary agenda: contained costs and the realisation of a collective facility that allows for the shared and participative use of its spaces.To respect the first objective the materials used to build the project were all sourced inside Rwanda, and for the most part in the region of Rwinkwavu. 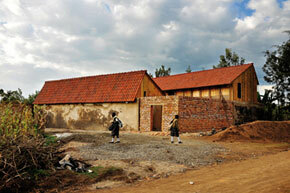 Almost all labour was provided by inhabitants from the neighbouring area. Local stone was quarried and used for the foundations and landscaping. Large cut blocks were used to build the retaining walls of terraced sections that regulate level changes across the site and function as bases for the two twin housing structures. The two buildings, by exploiting the gentle level changes present on the site, create a simple yet dynamic composition. ASA (Active Social Architecture) is committed to the value of architecture as a means for improving living conditions for people, consolidating communities and a sense of identity and belonging. With this aim in mind, the office works in collaboration with many international NGO’s and agencies of the United Nations. This is the backdrop to the Early Childhood Development & Family Centres (ECD&F), a priority programme being implemented by UNICEF in Rwanda. It is not an isolated work but rather a system of parallel initiatives, located in 14 distinct parts of the country and designed to provide the selected villages with family support centres. This scheme became a reality based on two plan models that work as base typologies: a system with a central plan and a more open and permeable S-shaped layout. The interiors of the two prototypes are occupied by classrooms, a multipurpose room, a demonstration kitchen, the administrative wing and a block of hygienic services.